Hello! I was trying to setup with the Selected Track control http://stc.wiffbi.com/download so that I can solo a track by pressing a keyboard shortcut but wasn’t able to get it to work. I can route a midi note to a keyboard key but not the other way around. Any help would be appreciated. Hi, I downloaded the Ableton File. That is not what I need. If you want to control with your MPK Mini 2, you should probably just select your input device as MPK Mini 2 if Ableton Live supports it. Otherwise you can use Bome MIDI translator pro and use with your STC script. You will need to use Bome MIDI translator pro to translate what your MPK sends to what the STC script receives. 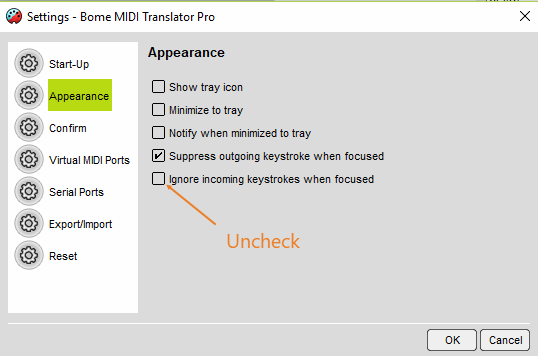 If you want to translate keystrokes from your computer keyboard to what the STC requires, then you can also use Bome MIDI Translator Pro, however you should keep the following in mind. The default settings of MT Pro is to ignore keystrokes when MT Pro is in focus, so you need to either not focus on MT Pro when you hit you keyboard (recommended) set set MT Pro to allow keyboard when focused. You can find this in settings as shown in the attached screen shot. I also attached an example project file for just Control(S) to the keystroke I believe STC is expecting. Also make sure you have followed the instructions for installing the MIDI remote script and there are no errors in the status area of Live when you enable the script. I assume you have confirmed that your MIDI remote script is properly installed and working. I attached an ableton file I’m not sure if it will help. Hi, could you post your project file? I assume you are trying to use a computer keystroke to convert to a MIDI message that in turn will send the resulting MIDI message to Ableton Live via the selected track control script. With this a anticipate you actually do not have an external MIDI controller. I have the MPK Mini 2, that is what I want to accomplish but haven’t been able to do so. Do I need to change the settings?